Palm's latest and most successful Palm OS smartphone, the Centro, has just received not only the rumored cosmetic facelift reported some time ago but an unexpected and welcome hardware boost as well. The device is also seeing special holiday pricing to the tune of $79.99 after a $100 mail-in rebate. As reported earlier, the new colors sport a soft-touch finish in the official shades of "Vibrant Rose" and "Olive Green". 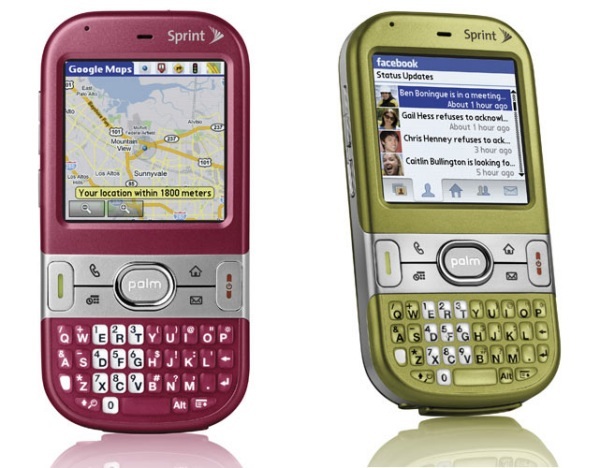 In addition to a RAM boost and new colors, the new Sprint Centro also comes with newer versions of Google Maps and Palm's Facebook app that were unavailable when the original Centro shipped standard in ROM. In an unprecedented move, Palm has made a considerable improvement to a current device's hardware without indicating it as a new model or through prominent fanfare. The new Centro, as specifically stated in Palm's press release, now has 128mb of user-accessible RAM, up from the original version's ~68.6mb of available memory. In years past, Palm denoted a unit with upgraded memory specs with new nomenclature, such as the Treo 700w to 700wx refresh. Due to the Garnet OS' difficulty in recognizing external storage volumes larger than 4GB, Palm likely felt that boosting the device's internal memory was the easiest way to give users a boost in their device's usability. The refreshed Centro now joins the five-year old Tapwave Zodiac 2 and the three-year old Palm TX as the only Palm OS devices with greater than 100MB of RAM storage available to the user and is the first Palm OS smartphone to reach this milestone. Palm is also releasing a handful of new accessories alongside the refreshed Centro. This new crop of accessories is comprised of two new leather cases in side and flip-styles, and a new car charger SKU that offers both microUSB and Athena Multiconnector plugs. The devices will be available as soon as October 19th at "select retail locations" and from November 2nd in Sprint corporate retail stores and the usual consumer/business direct channels and online at Palm.com. No word as of yet if the hardware improvements will eventually carry over to other Centro colors or if the new Olive and Rose versions will gradually replace the older Centro stock. Launched in October of 2007, the Palm Centro is available in both AT&T GSM, unlocked GSM, and Verizon versions domestically in addition to a variety of international carrier partners. To date, no other carrier partners have been mentioned as receiving the upgraded Centro. wow. new colors and 128MB RAM. no real upgrade there for me. i like black AND i have 45.2MB of 68.8MB free anyway. if RAM is all you're going to change, why bother? only a few who buy a centro even care as noted in previous posts. Perhaps they're running out of 64MB chips and they're so old that suppliers don't want to stock them anymore. Very likely and I was just thinking about posting to reflect that. Actually, it's probably more like Palm's partner for the Centro (HTC?) told 'em that 128mb chips are getting too hard to get and they need to bump up to 256mb modules. The "old" Centro had 68.8mb free out of the box. So it basically had a 128mb module, with ~10mb dedicated to the heap, ~18 for cache, 32mb allocated for the OS and the rest available for user storage. So, in theory, Palm's nearly doubling the amount available to the user for storage and presumably boosting the heap/cache sizes as well. If that is indeed true, that could combine with the NVFS optimizations & tweaks Palm already made for the Centro to make for what could be the snappiest smartphone on the market. If Palm could just eliminate the lag when launching or exiting Blazer and when switching to and from the phone app, they'd have the fastest Palm OS device since the classic T3. Palm's already removed the pink & red Centros from their Sprint section. So since they specifically mention the Onyx black Centro as part of the current lineup, they'll either keep seling the black one as a cut-down 64mb version or they'll eventually get around to boosting its RAM & paint to match the new colors. Well, Gekko, the RAM boost won't matter one bit to existing owners and no one is going to buy a new device at full price just to get 2x the memory. But it looks good on a spec sheet and might win over a few buyers who were sitting on the fence trying to decide on a Centro. And less tangibly, more RAM means a few less support headaches from Sprint/Palm from customers who fill up their devices with e-mails & photos. It also looks good to Palm shareholders and indicates that the company is still doing SOMETHING (aside from *ahem* putting the finishing touches on Nova). Maybe they increase the actual RAM? Is it possible that they increased the actual RAM that is used for DBCache? I love my Centro, but the only time it's slower than my coworkers WM phones is when you switch between Blazer and Email. I'm assuming this switch takes so long because both Blazer and VersaMail max out the DBCache such that it needs to do a flush when switching between the apps. Just a though... If you could eliminate the DBCache flushing lag, the Centro would honestly be one of the fastest smartphones on the market. Even some of the top-end Nokia devices and the iPhone get pretty laggy when heavily using the web and other apps.